Out of the over 140 schools in competition for the first edition of Preparation Centre Awards in Romania, English Kids Academy (International House), Bucharest has been declared „the best training centre“ at the “step-by-step approach” category. This award acknowledges the quality of the students’ preparation for the Cambridge English exams. 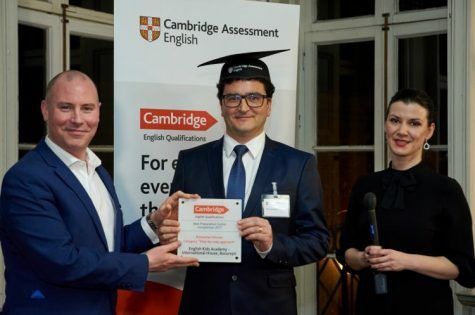 In 2018, Cambridge Assessment English launched Preparation Centre Awards for the first time in Romania in order to reward the best exam preparation centres. There have been awarded three prizes for three categories: preparation method, new centre and step-by-step approach. International House Bucharest operates in Romania since 2002 and is famous for the English courses provided. English Kids Academy is the specialized in English for children and teenagers of International House Bucharest. Throughout the academic year 2016-2017, 2400 children, aged 1 to 18 years old have been enrolled at the academy level. Out of which, 668 students took the Cambridge exams in May 2017 and the results obtained were outstanding: at the YLE (Starters, Movers, Flyers): 448 candidates, out of which 91% got maximum points for Speaking. A2 Key and B1 Preliminary exams – 191 candidates, 100% graduation rate. „We recommend the step-by-step approach, as it is the best way for supporting and preparing children, both for real world communication and for obtaining excellent results at higher level exams, necessary to children for higher education and for the careers they will take up later on. The proof of its efficiency resides in the above-mentioned results, obtained by children who followed this step-by-step approach,” stated the IH Team. * Preparation method: institutions that best use the official preparation materials for Cambridge English exams, published by Cambridge University Press. * New-comer: a new school which has introduced the preparation for Cambridge English exams recently. * Step-by-step approach (‘Cambridge path’): an institution following the progressive preparation system and offering Cambridge English exams for all learning levels. Institutions can compete under more categories, but can win only for one of them. For the first edition in 2018, Cambridge Assessment English has received more than 140 applications from Romania. Cambridge English Exams are acknowledged internationally by more than 20,000 universities, employers and public institutions worldwide. They open the way to higher education, increase employment opportunities and education or work opportunities. Preparation for these exams allows all students to obtain a very good level of English, both written and oral. Preparation for exams can be done in the school where the student studies or in institutions such as language centres which offer exam preparation during courses that offer a well-defined learning path. Cambridge Assessment English is a department of the University of Cambridge (Great Britain) specialized in evaluating and certifying English skills. Yearly, more than 5.5 million candidates in 130 countries have a Cambridge English exam. Diplomas are acknowledged internationally by more than 20,000 de Higher Education Institutions, employers and government organisations. “Cambridge exams have allowed our son to reach a very good speaking, understanding and writing level in English, enabling him to enrol at a British university next year. Many children miss the opportunity of being admitted at a faculty abroad due to the fact that they did not pay attention in due time to studying English and to certifying the level reached. As a parent, involved in the education and development of children, I recommend Cambridge exams and the English Kids Academy preparation course for a better future and a successful career for our children.” – Mihai, Petru’s father, 17-year-old IH student.